American kids get expelled for making a gun gesture with their fingers and these kids are allowed to bring daggers to school because of religious reasons. Football coaches are fired and sued for praying before a game and these kids are allowed to bring daggers to school for religious reasons. 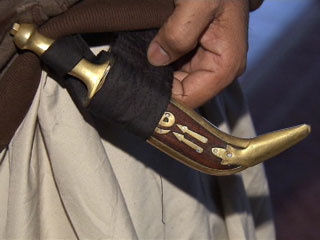 A Detroit-area district says it’s allowing Sikh students to wear a small, religious dagger to school, MyFoxDetroit.com reports. Plymouth-Canton School District Allows Ceremonial Dagger.